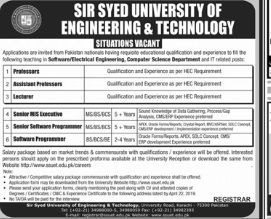 Senior MIS Executive Job is available with SIR SYED UNIVERSITY OF ENGINEERING TECHNOLOGY in Pakistan, Karachi. It is a Senior Level level role. This applicant should be MS/BS qualified for this position. This job will expire on 15 May 2019. This job involves skills like Patience,	Adaptability,	Imagination,	Teamwork,	Risk Taking,	Constant Learning,	Communication,	Mentoring, Experience required is 5+ Years.